Ryukyu dance developed as a court dance in the 15th century in the Ryukyu Kingdom (present-day Okinawa). It was originally performed to welcome envoys from China. The restrained nature of the dance is unique  emotions coming from the music build up inside the dancers, but they let only subtle movements express their feelings. "To me, the slow-paced rhythm of Ryukyu dance comes from the rhythm of nature in Okinawa." Above: Majikina Yukako learns traditional dance from Ashitomi Noriko. She practices at least three hours a day. 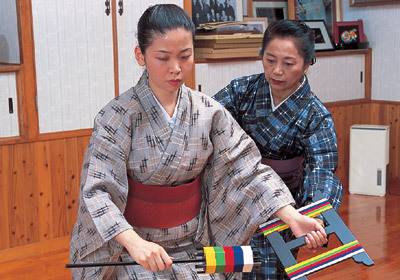 Right: In the kasekake dance, Majikina becomes a maiden weaving kimono cloth for her far-off lover, holding a spinning wheel in her hand. 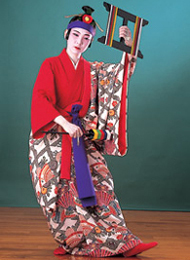 Majikina Yoshiko is the head of the Shinyo-ryu school of traditional Ryukyu dance. Her 29-year-old granddaughter, Yukako, quit her job on her birthday in 2000 in order to master the dance. "After some soul-searching, I finally knew I wanted to take responsibility for the school one day." As a young girl, Yukako used the dance studio as her playground. When she started elementary school, she began training to be a dancer, under strict supervision. People involved in the Shinyo-ryu school expected her to lead it one day, but she rebelled against the idea and took off to Tokyo after graduating from high school. And yet, the Ryukyu style of traditional dance eventually drew her back to Okinawa. "When I was in Tokyo I went to many Kabuki and Noh performances. I ended up thinking that Ryukyu classical dance is just as good. It captivates the audience, just as Kabuki and Noh do, but in a different way." 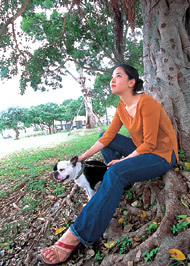 Back in Okinawa, she began studying under Miyagi Yukiko, a teacher in the same Shinyo-ryu school. "Ryukyu dance lets me touch the ancient spirit of Okinawa. The spirit seems to flow through me when I dance in the old, classical way." Yukako won top prize in the 2001 Ryukyu Dance Competition sponsored by an Okinawa newspaper. Now she's studying hard under her grandmother, the head of the school. "Training demands a tremendous amount of concentration. It's easy to dance and look like a pretty doll, but it's really hard to express my own feelings in the dance movements. To express feelings properly, a dancer must have experienced the full intensity of various human emotions, and I'm still too young to have known all that." Her grandmother's dance is so breathtaking it makes the audience completely lose themselves in the action. Yukako knows she is far from being able to achieve this, but she's just as willing as her grandmother to devote herself to Ryukyu dance. "Even if it takes a hundred years, I'm going to work at it until I'm better than her," she grins.